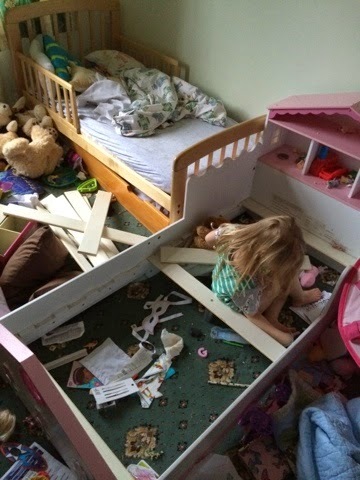 Emma in Bromley: TeaBreak Tuesday - How Long Does It Take a 3 Year Old To Dismantle a Bed? TeaBreak Tuesday - How Long Does It Take a 3 Year Old To Dismantle a Bed? My 3 year daughter - Maegan very much has an inquisitive mind, she likes to figure things out herself and is very independant - she has a natural talent for taking things apart - especially things she shouldn't! Maegan was playing nicely in her room so I took a moment to rush a laundry basket down and put a load on - I was out of the room for 3 minutes. In this time, Maegan had decided to stop playing nicely with Nooonicorn (her favourite unicorn) and instead pull the mattress off the bed (and fold it in half??!! ), remove all the bedslats and pretty much trash the whole room! It takes a 3 year old less than 3 minutes to dismantle a bed! I may or may not have laughed and cried at the same time! I was greeted by the biggest proudest smile and "Look Mamma, I made a hidyhole den!" The bed fortunately took only a few moments to put back together - the rest of the room will take a lot longer!